Meanwhile, in preparation for the International Year for the Culture of Peace an information exchange system was established using Internet to serve all of the participants in the global movement. This system was developed by the team that had come to the unit with Enzo Fazzino on the basis of their previous experience with the Planet Society exchange initiative. It consisted of two Websites, one a public site called IYCP and the other a limited-access site called IYCPTEC. Each partner signing a partnership agreement received a unique Internet Access Code enabling them to put information about their flagship events, projects, Manifesto signatures and newsletter articles on the IYCPTEC site. The information was then automatically transferred to the public IYCP site. As of this writing in 2003 the culture of peace website continues to be maintained by UNESCO, at, including the Planet Society exchange system. 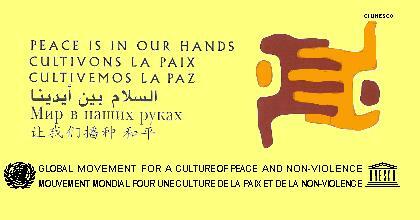 Much of the historical material from the International Year for the Culture of Peace is available on the site, including articles written by NGOs and a listing of the signatures obtained on the Manifesto 2000 from those countries with large numbers of signatures. This model of paired Websites, one public and the other private, by which partners could enter information, was used as the basis for two projects proposed in February 2001 for development by UNESCO in 2002 2003, one for culture of peace education materials, the other for information about the activities of all UNESCO partners. The process by which these projects were conceived involved a series of meetings and discussions by intersectoral working groups. In addition, a third project was developed by young professionals, including Zeynep Varoglu, for the further development of CPNN. The CPNN and Planet Society Internet systems continue to be supported in principle by UNESCO and United Nations documents for the culture of peace: paragraphs 24 and 25 of UN Document A/55/377 of 12 September 2000; paragraphs 49 and 50 of UNESCO document 161 EX/17 of 19 April 2001, operative paragraphs 8 and 9 of UN General Assembly Resolution A/56/5 of 13 November 2001 and operative paragraphs 7 and 8 of Resolution A/57/6, 27 November 2002. However, as of this writing in 2003, these systems are still small and without resources from the United Nations or other funding agencies. Both the Planet Society system and the site of CPNN are accessible by Internet.